YOTEL San Francisco is a refurbishment of a historic building on Market Street, and will be opening in 2018. YOTEL is the hotel brand that gives you everything you need and nothing you don't. Inspired by first class travel, YOTEL translates the language of luxury airline travel into smart, well-designed spaces without the hefty price tag.Our San Francisco hotel is the fourth YOTEL city hotel and will have large open areas specifically designed for co-working, social gatherings and relaxing. We love technology and it lets you save time to spend on fun things. You can avoid queues by using our 24/7 self-check-in kiosks- making it child's play to check- in, in under a minute. The YOTEL app is an easy way to request early check-in or late check-out and you can also browse our recommendations on where to go and what to do when in San Francisco.BEST LOCATION IN MID-MARKETYOTEL San Francisco will be in the heart of San Francisco's downtown Mid-Market district, now home to company headquarters like Twitter, Uber and Square. Situated at 1095 Market Street, the hotel will have spectacular 360° views from our rooftop terrace with the financial district on one side and City Hall on the other. This is YOTEL's first conversion project with a great history to boot. The historic Grant Building was one of only a few buildings to survive the famous 1906 earthquake. 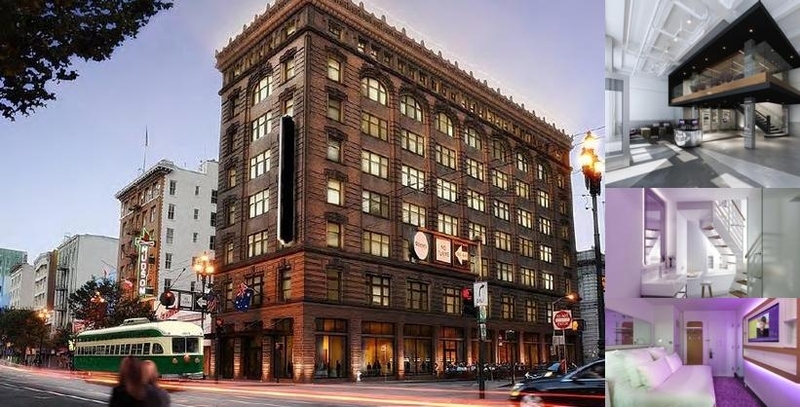 Our amazing building was obviously built to last and we're giving it a new lease on life and making it part of the future of San Francisco.The hotel is centrally located with easy access to transport links and a short walk from the famous Powell and Market Cable Car turnaround. We're only a 20 minute taxi ride from San Francisco Airport making it ideal for your next business trip, holiday or both!WORK! PLAY! EAT!Whether you stay with us on business or leisure, we have beautifully designed spaces to suit every need and mood and let's face it – we like to keep things social!Club Lounge, a signature feature of YOTEL, is our cleverly designed open spaces ideal for co-working, informal meetings or even just getting away from it all. Situated on the mezzanine level above Mission Control and Alta Restaurant, this space is not only available to all our guests, but we welcome anyone fancying an informal catch-up with colleagues or even just a break from the office. LUXURY BY DESIGNUncompromisingly designed around the needs of guests, our new YOTEL San Francisco will have cleverly designed rooms, or 'cabins' as we like to call them, with everything you need and nothing you don't. Apart from our beautiful Loft Cabins with a mezzanine sleeping space, a first for YOTEL, all other cabins feature YOTEL's signature fully adjustable SmartBed™ with Serta gel mattresses, rejuvenating monsoon rain showers, adjustable mood lighting, more than enough power points and smart TVs that can easily be connected to guests' own devices. At YOTEL we want you to be super comfortable so that you can enjoy your stay your way.ROOFTOP WITH A VIEWIf you stay at YOTEL San Francisco, you'll be able to enjoy priority access and stunning 360° views of the San Francisco skyline from our 10th floor rooftop terrace and bar. The terrace will have outdoor seating, making it an ideal choice for a night out and will become the place to be and be seen in San Francisco, especially on parade days.We have partnered with Alta Group and award-winning chef Daniel Patterson for our food and beverage offering. YOTEL San Francisco will feature an all-day Alta Restaurant and Bar on the ground floor, as well as a rooftop bar and terrace called The Grant with sweeping views of the city. FROM THE AIRPORTSan Francisco is serviced by two main international airports, San Francisco International (14 miles/ 21km) and Oakland International (19 miles/ 30km).Taxis to downtown San Francisco from SFO take 20 - 30 minutes at a cost of around $40 - $65, and from Oakland around 35 - 60 minutes at a cost of $50 - $70. Local Shuttle Info: Hotel does not offer local shuttles but is the center of hub of transportation for SF Muni and BART transportation systems.